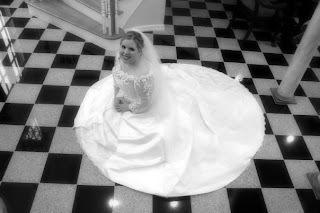 I remember the day I chose my wedding dress. The dress was the 2nd dress I tried on. I remember dreaming of this since I was a little girl. I was so excited to be engaged and so excited to plan Russell and my wedding day. I wore my mother's veil. 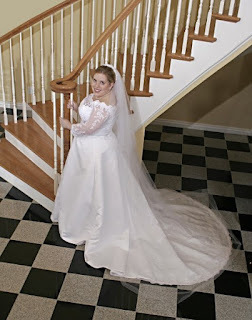 My sister, Kelly also wore it when she got married in 1994. My parents got married in 1969. My Mama wanted me to have a little something special from her dress in my dress so she sewed a small patch of her dress inside my new wedding dress. I thought that was very special. Here we are after we said, "I Do!" 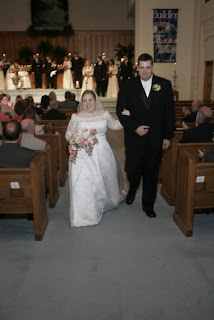 My dress was 3 quarter length sleeves with beading and a chapel length train. This morning, Russell and I met Amy, Tony, Ron, and Debbie at the hospital early this morning--5:30 a.m! But we were so glad to be with our family. Here is a picture of the view from the hospital room. Can you see Amy in the glare of the window??! Here are Amy and Tony waiting this morning. Here is a verse that was in the hallway at the hospital. Amy had a c-section this morning. AWWW! The moment we first saw Leighann in the nursery was a happy one! Here are the new grandparents: "Grandpa and Nana". Leighann Grace was born at 7:54 this morning. Here is a sweet family! Isn't this a precious picture??! And this was when I got to hold Leighann for the first time. I absolutely LOVE babies. They are so precious. Leighann is just beautiful! Well, I will have more pictures to come! We are still at the hospital! Well Amy and Tony's baby girl, Leighann will be here tomorrow! Last night we just had to celebrate. Russell and I went over to their house to visit with Amy, Tony, and Amy's mom and Dad (also Russell's Aunt Debbie and Uncle Ron!). We had a good time! I decided that I should pamper Amy and Debbie, so I gave them spa pedicures and they tried satin hands and satin lips. I wanted them to be relaxed because Leighann will be here soon! Amy decided to make a Tapioca cake. She was so excited to make it, plus I think she had a burst of energy too! She thought it would be great to add Leighann's monogram to the cake with blueberries. Isn't it cute? So we call this "The Baby Cake"! It was so yummy too. We are totally ready for Baby Leighann! A C section is scheduled for tomorrow morning. Russell and I will be at the hospital with bells on! Please pray that everything is smooth for tomorrow and everything will be great. Yes, July has been JAM PACKED busy, but that is okay! This week I am helping with our church's Bible school. 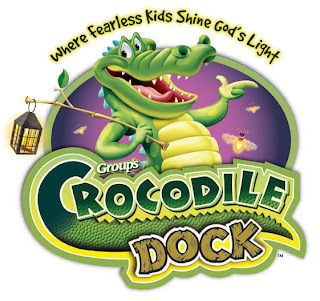 The theme for this year is "Crocodile Dock". 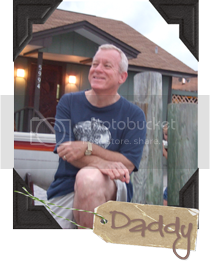 I am a crew leader and I am really enjoying helping with it. I really enjoyed helping the kids this morning. However tomorrow, I won't be there! I'll be waiting for Leighann to enter the world! OKAY! Yes, I am excited! I will be "Aunt Meredith" to Leighann so yes, I admit I am excited! I hope my excitement is contagious for ya'll! Have a great day! Celebrating America: Fireworks, Betsy Ross, and Steak! Happy 4th of July! God Bless America! Last night we went to see fireworks with Amy and Tony. It was fun! 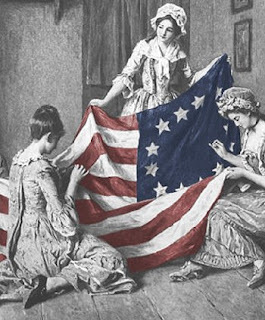 Just a fun fact: I once played Betsy Ross in a school play when I was younger! I even had a hat similar to the one pictured! HA! Belle also says: "Happy 4th of July!" She is 9 months old now! WOW! She is still a puppy though. Russell wanted to make a dinner to celebrate the 4th. So he grilled steaks for us. Have ya'll ever had the blue cheese crust on your steak from Ruth's Chris Steakhouse? It is my favorite! We found the recipe for it on google! Russell also made YUMMY sweet potato fries with garlic mayonnaise-which was SO GOOD too! Hope yall have a great rest of the weekend! Okay ya'll! You asked, and I share! Here is a quick and easy recipe for banana pudding. Who wants to see this movie? I do! I hope we can go see this movie soon. I read the book by Jodi Picoult about 2 years ago and just cried and cried. I think it will be a good movie but sad too. Well ya'll, it's JULY! WOW! This year has literally flown by so far!